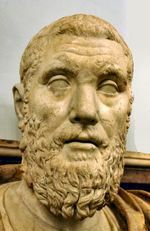 Born in Caesarea (modern Cherchell, Algeria) in the Roman province of Mauretania to an equestrian family, Macrinus received an education which allowed him to ascend to the Roman political class. Over the years he earned a reputation as a skilled lawyer. Under the emperor Septimius Severus he became an important bureaucrat. Severus’ successor Caracalla appointed him prefect of the Praetorian guard. While Macrinus likely enjoyed the trust of Caracalla, this may have changed when, according to tradition, he was prophesied to depose and succeed the emperor. Rumors spread regarding Macrinus’ alleged desire to take the throne for himself. Given Caracalla’s tendency towards murdering political opponents, Macrinus probably feared for his own safety should the emperor become aware of this prophecy. According to Dio, Caracalla had already taken the step of re-assigning members of Macrinus’ staff. In the spring of 217, Caracalla was in the eastern provinces preparing a campaign against the Parthian Empire. Macrinus was among his staff, as were other members of the praetorian guard. In April, the emperor went to visit a temple of Luna near the spot of the battle of Carrhae, accompanied only by his personal bodyguard, which included Macrinus. Events are not clear, but it is certain that Caracalla was murdered at some point on the trip (perhaps on April 8). Caracalla’s body was brought back from the temple by his bodyguards, along with the corpse of a fellow bodyguard. The story as told by Macrinus was that the dead guard had killed Caracalla. By April 11, Macrinus proclaimed himself emperor. 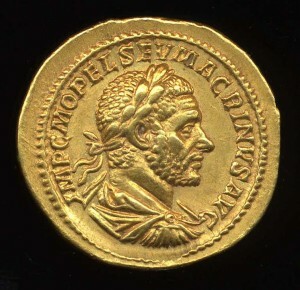 Macrinus also nominated his son Diadumenianus Caesar and successor and conferred upon him the name “Antoninus”, thus connecting him with the relatively stable reigns of the Antonine emperors of the 2nd century. Previous PostBlack Emperors of Rome: Marcus Aemilius AemilianusNext PostThe AIDS Scam: 300 die of “HIV/AIDS” each year in Nigeria – Where is the Pandemic? Who ever is knocking these noses OFF just makes it more clear of what they are hideing!? It seemed like the world wasnt to bad with these rulers! Hey there not sure how to message you guys privately. The British Museum of Art has three collection online that you should probably take a look at.Objects from the Roman cities of Pompeii and Herculaneum, Objects excavated from the Anglo-Saxon ship-burial at Sutton Hoo, Paintings from the tomb chapel of Nebamun and more. Give some feedback because I know that you all will see the same things I see. I didnt see what you ment please explain?